The following gate service was provided in the mall of Bayshore, Long Island. You are probably already aware previous experiences that mistakes can often be costly and detrimental. However, if such mistakes are avoided before they even occur, such negative outcomes can be prevented. In terms of industrial and residential security door and gate services, mistakes often stem from the carelessness, indifference, and lack of knowledge a company exhibits when completing a job. 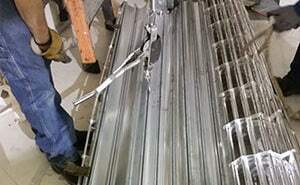 At Rolling Gates NYC, we take pride in not only obtaining the greatest quantity of customers, but more significantly, we pride ourselves on our ability to keep these customers. Like all of our gates, this is the story of the store front gate constructed at Swarovski in Bayshore Long Island, New York. We received a phone call from the store owner in the Long Island Mall about a damaged gate with an unlabeled grille carton. We sent our experienced technicians to identify the problem. Ultimately, after determining the source of the issue, we were alarmed, but not surprised, to find out that the previous rolling gate company installed the gate with minimum wall support. Not only was this a safety issue, but the gate was also at an improper height to accurately fit the opening of the store. As stated, the gate company that initially installed the gate did a poor job with little safety regulations, maybe you know who they are, their name rhymes with ‘pity-gate’. 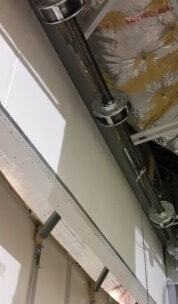 With the extreme disregard for safety that was exhibited, we had to amend the issue immediately by both extending and reinforcing the gate to fit the store entrance and ensure that is follows mall safety requirements. When you work with Rolling Gates NYC, you are guaranteed to have a rolling gate that works at optimal efficiency and safety. We recommend avoiding such rolling gate installation problems by choosing a reputable gate company that uses only high-quality materials and hires only the most experienced workers. Though the price may be slightly higher than our competitors, you can be sure that you will be worry free after we finish our work.